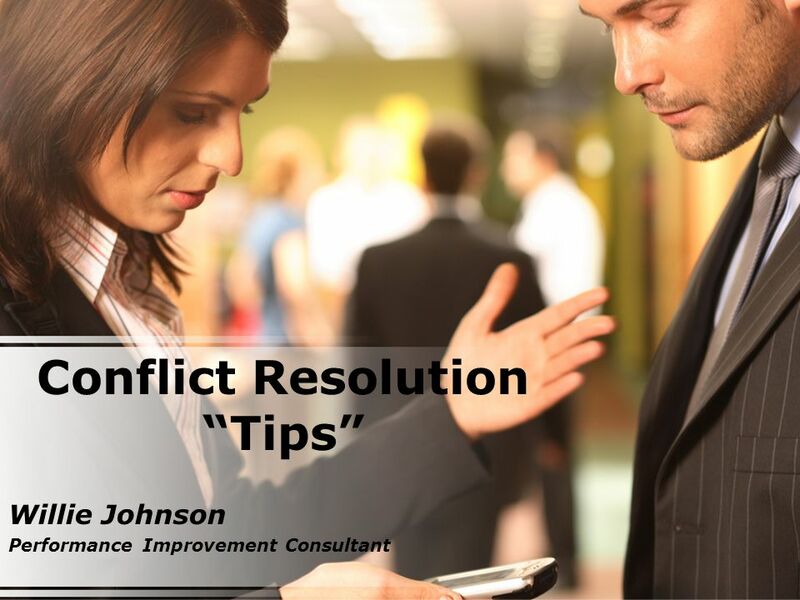 Conflict Resolution “Tips” Willie Johnson Performance Improvement Consultant. 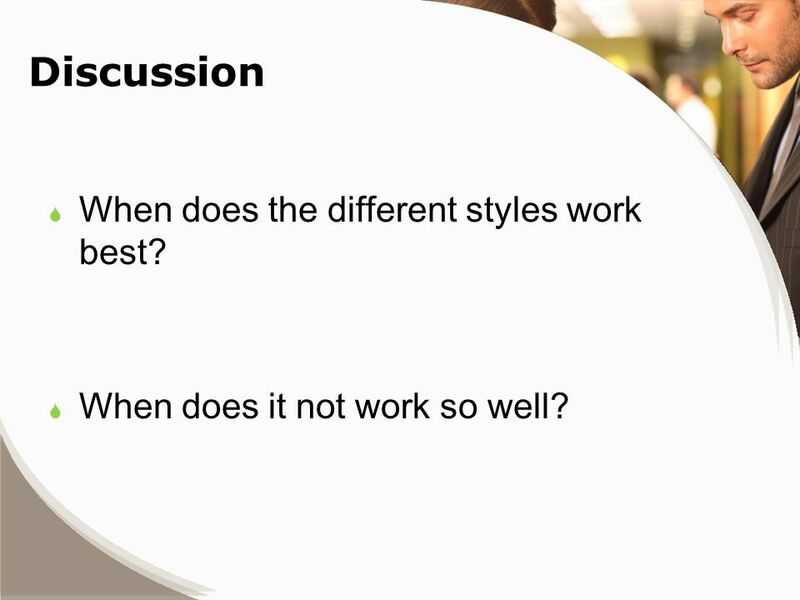 4 Discussion  When does the different styles work best?  When does it not work so well? 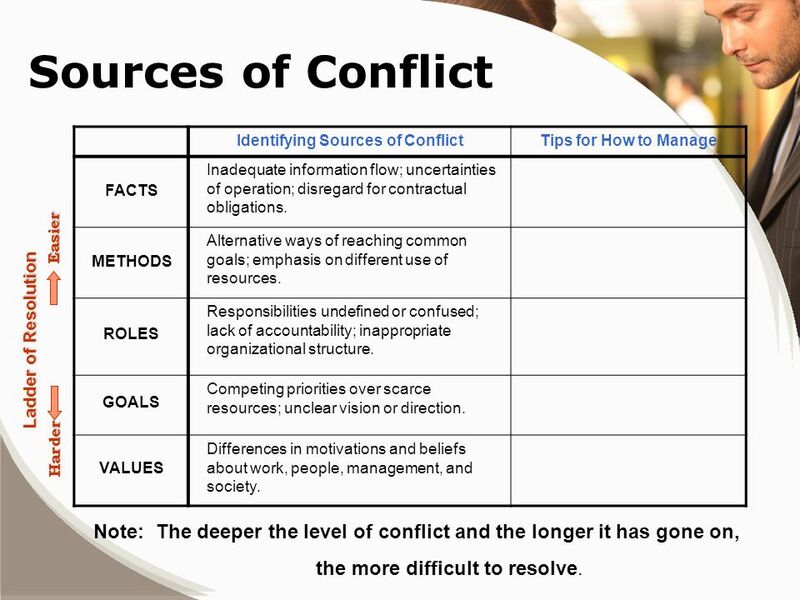 10 Sources of Conflict Identifying Sources of ConflictTips for How to Manage FACTS Inadequate information flow; uncertainties of operation; disregard for contractual obligations. 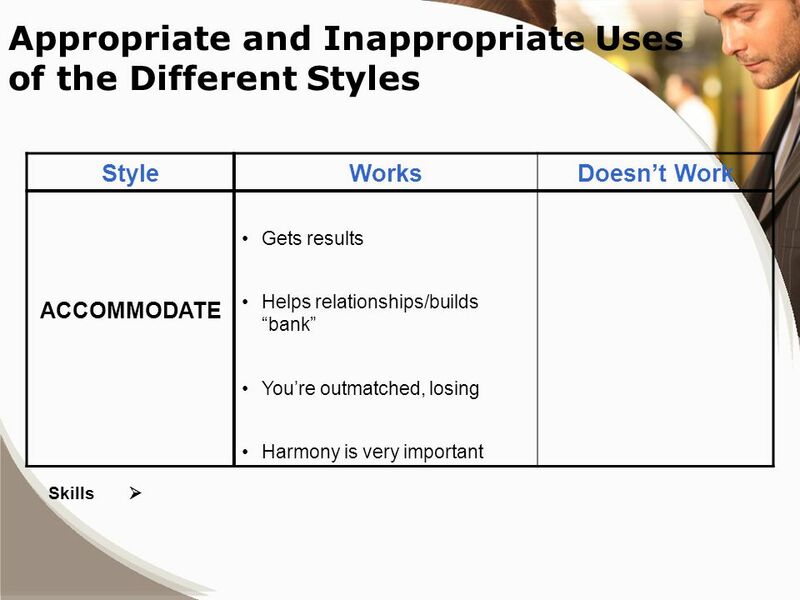 METHODS Alternative ways of reaching common goals; emphasis on different use of resources. 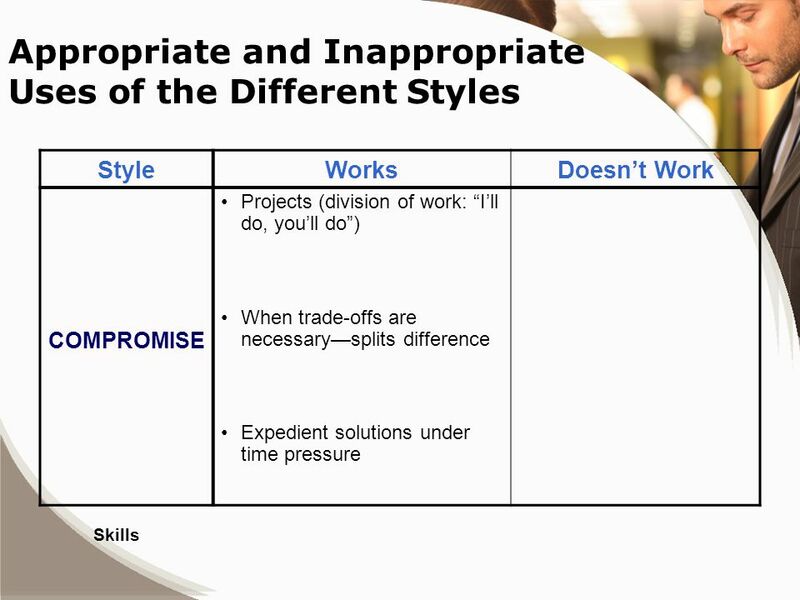 ROLES Responsibilities undefined or confused; lack of accountability; inappropriate organizational structure. 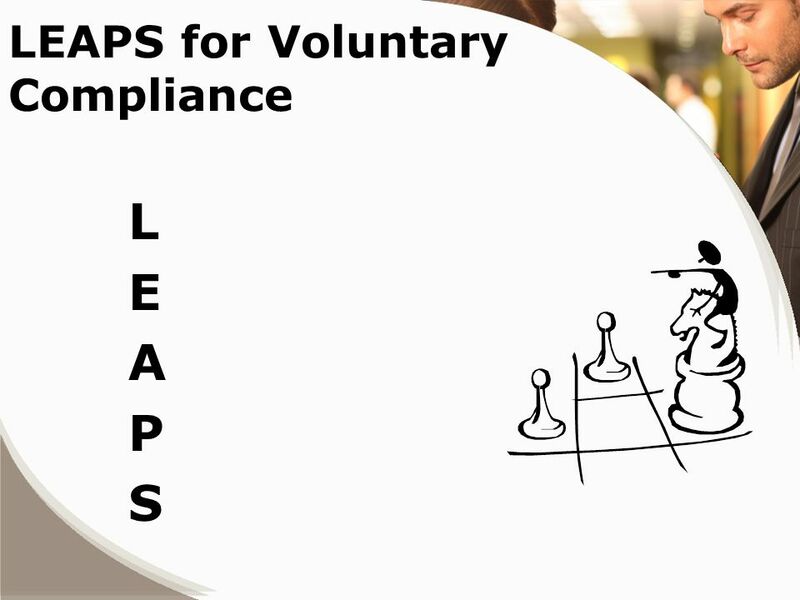 GOALS Competing priorities over scarce resources; unclear vision or direction. 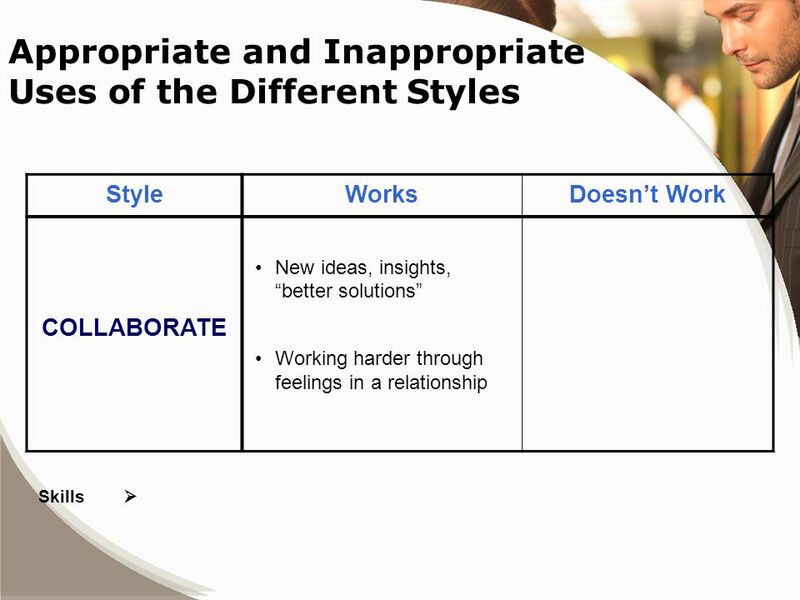 VALUES Differences in motivations and beliefs about work, people, management, and society. Ladder of Resolution Easier Harder Note: The deeper the level of conflict and the longer it has gone on, the more difficult to resolve. 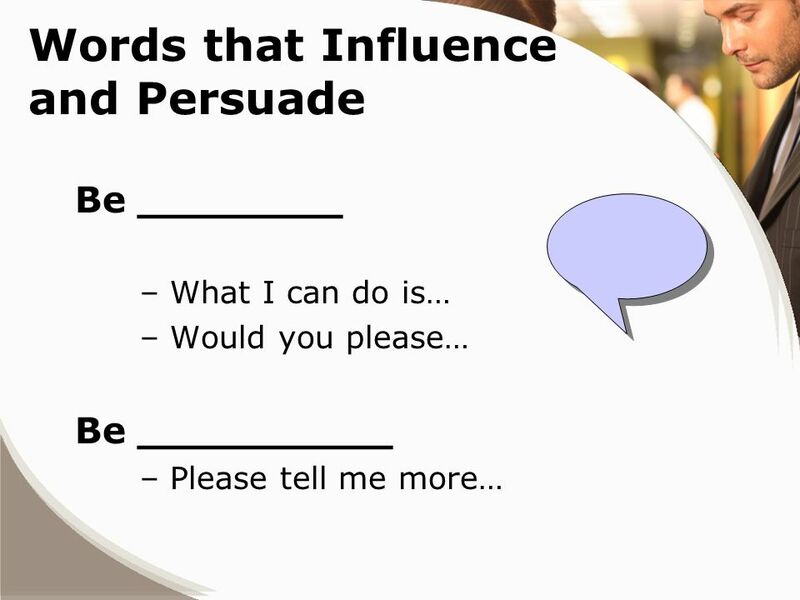 11 äDon’t waste energy with __________ who won’t listen. 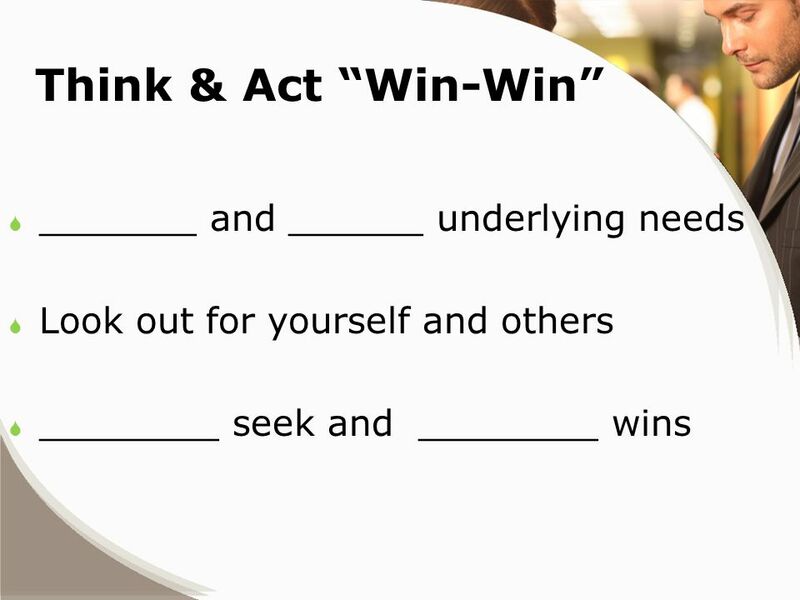 ä_______________, Agreeably (No-Deal is form of Win-Win). ä__________ with others and develop a new way of coping with the situation. 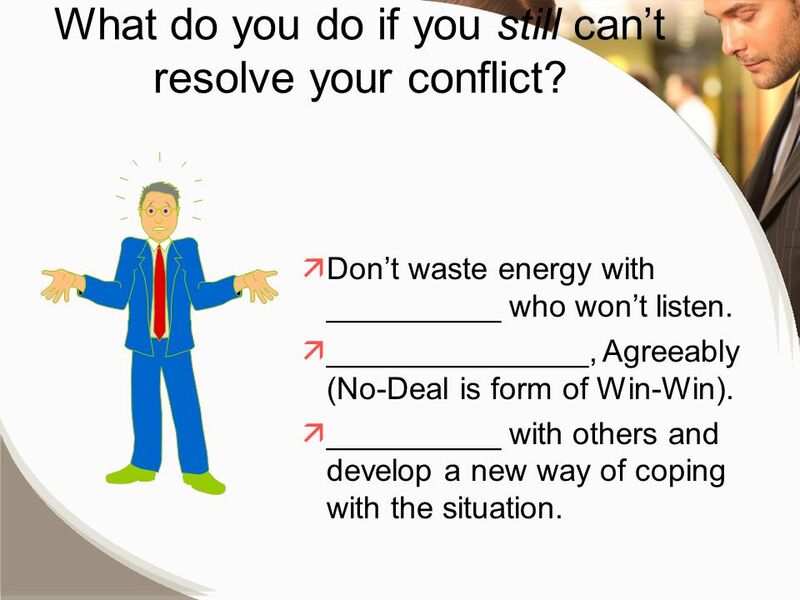 What do you do if you still can’t resolve your conflict? 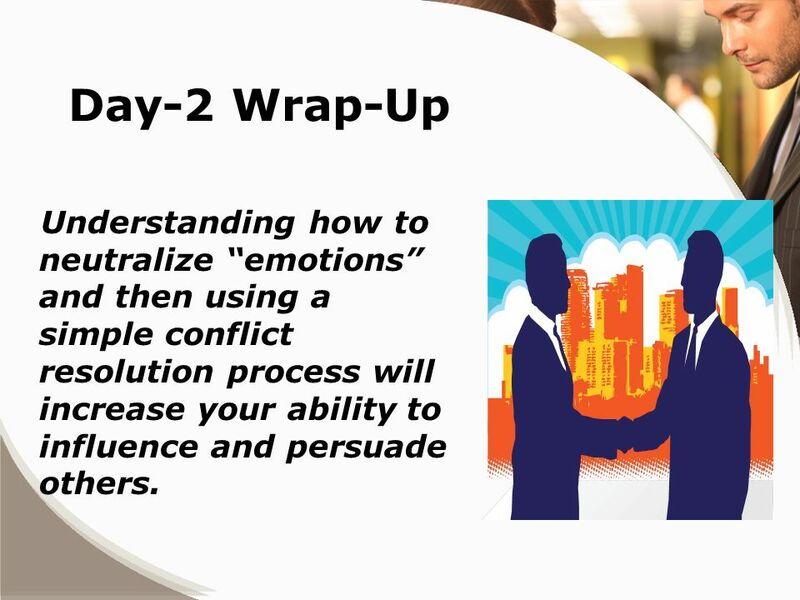 15 Day-2 Wrap-Up Understanding how to neutralize “emotions” and then using a simple conflict resolution process will increase your ability to influence and persuade others. 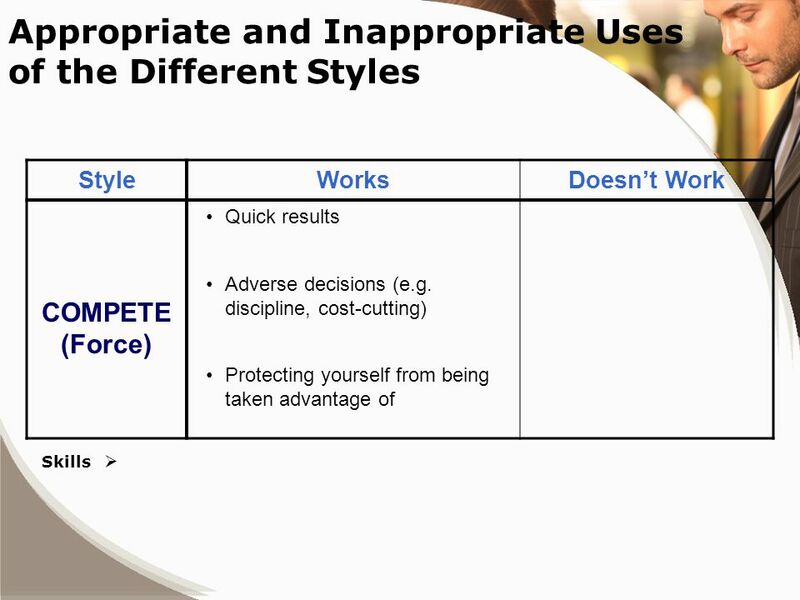 Download ppt "Conflict Resolution “Tips” Willie Johnson Performance Improvement Consultant." 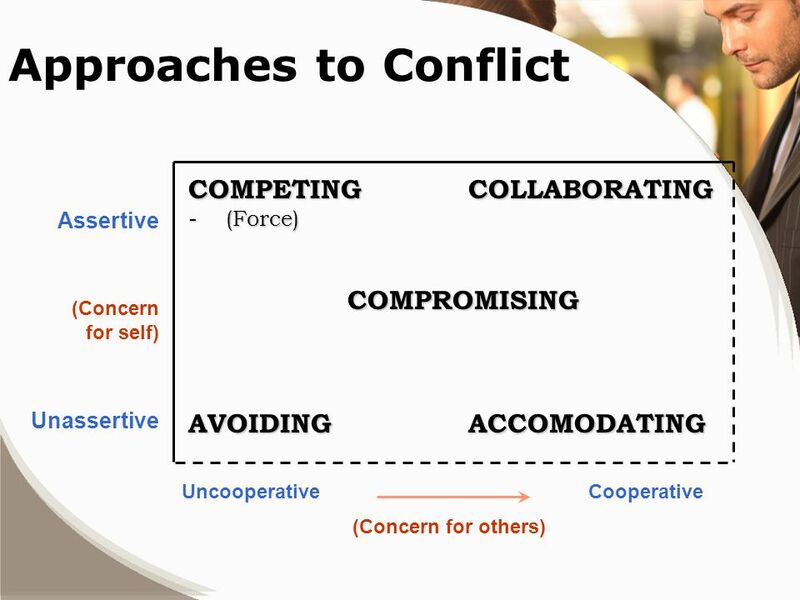 Conflict and Confrontation Definition of Conflict Intended effort of person A to block the efforts of person B. –Result – frustration or prevention of. 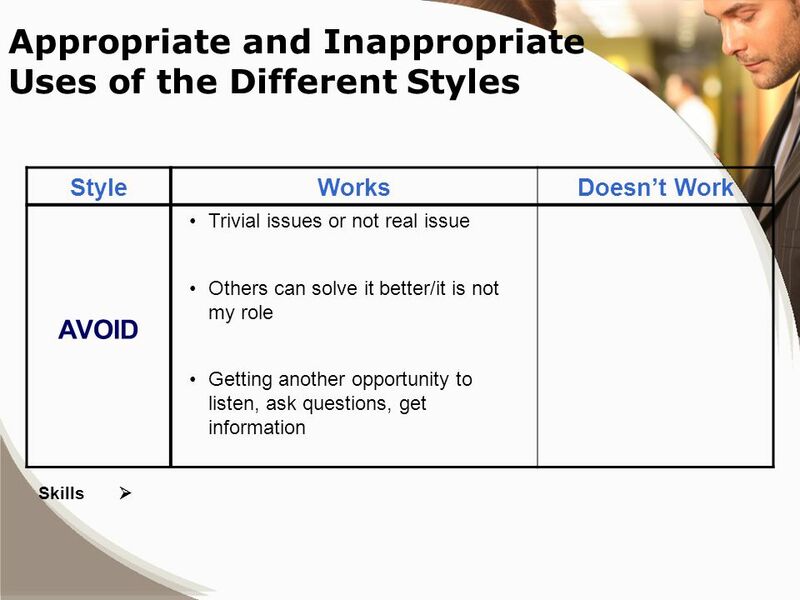 Examining Conflict Styles: How Do You Manage Conflict? 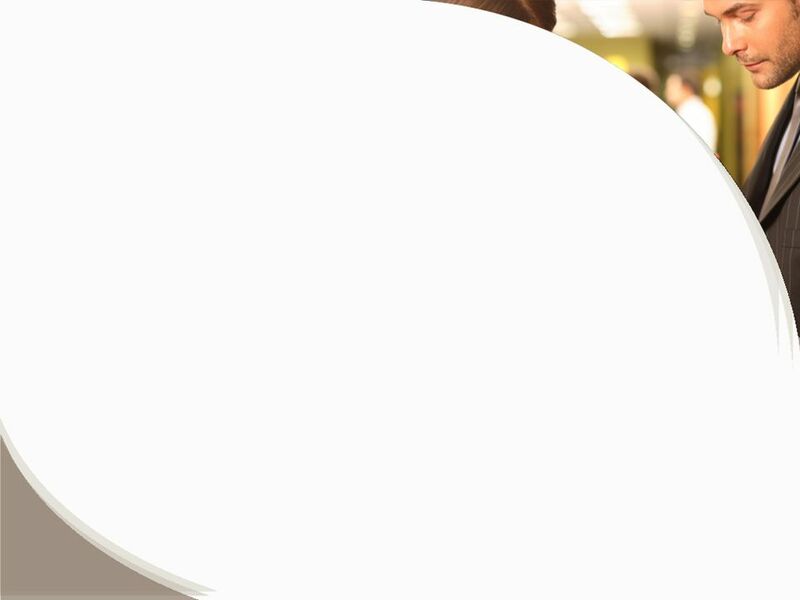 Conversations with Families, Coworkers, and Employees March 30, :30-8:30. Managing Conflict and Differences OB1 SIT, September 15, 2009, Brattleboro VT.
Jan Mahar Professor of Practice Professional Development – Theory and Practice Leadership, Conflict, Negotiation, Teamwork.